Everything one does comes under a scanner these days. The world has become such a place now that you can't even pee without some one else knowing. What we do, can either garner appreciation or criticism, but is rarely ignored. Since more than half of our lives are now led online, we need to be prepared for both. 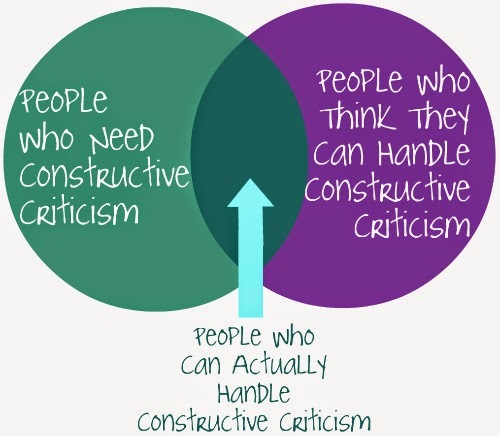 And we all know by now, that, not everyone can handle criticism. I'm not talking about the Bollywood movies, I'm talking about day to day things here. It can be a status posted on Facebook or a retweet on Twitter. If you put up something, you need to stand by it. No matter whose opinion it is. If it was your choice to put it up on social media, the least you can do is put up with the repercussions. I get a lot of flak for my blog posts. No, not surprising at all. I know that more than half of my readers visit my blog regularly and secretly wish that I drop dead. Great! I do care two hoots about it. Some even leave condescending comments as anonymous or using fake names and email ids. Slow salute for their patience! I make sure I publish such comments, and even reply to them. Most of them come back, see the reply and silently delete the original comment. Slow salute again! If you can't deal with what comes after your spewed venom, please swallow it yourself. Someone I know posted a selfie on Facebook. Her lips looked so swollen that I was worried. I commented asking if something happened to her lips. She promptly deleted my comment and blocked me. Turns out, it was a pout. Believe me it looked like a pig's lip job gone wrong. And then we have this string of status messages like, 'Good Morning', 'Have a happy Sunday' etc. My fingers itch to type something in return. I put up a picture of my pin board which said 'Finding the G spot' in it. I was referring to finding the G spot in the business that I plan to start soon. Many commented asking what it was along with a lot of smileys and sneering. I promptly replied back what it was. I was prepared to deal with what ever followed. Its very easy to put up something online for the sake of it or to show off, but it takes a lot of balls to deal with the criticism that comes your way. I visit so many blogs that have a lot of grammatical errors or a fiction piece that does not make sense. I have always been honest with my comments and point out the error politely or mention that probably I missed something in the story. Most of the times, the posts are deleted. Very few acknowledge my correction and thank me. I like such people. Unless you accept that you made a mistake, you cannot accept feedback. Very proudly we display our comment section on blogs, but how many of us actually publish all the all comments that come our way? Facebook seems to be Fakebook these days. With everyone faking pictures, stealing quotes and blatant plagiarism in articles, no one cares about what comes next. Everyone needs the appreciation to gloat, but one comment mentioning the truth and then hell breaks loose. I still remember the furor a post of mine caused, for writing the truth. I was criticised to no end and the anger still continues. I accepted all of it because I knew that I was not wrong. The very reason, why I publish crass comments that come my way and reply to them. 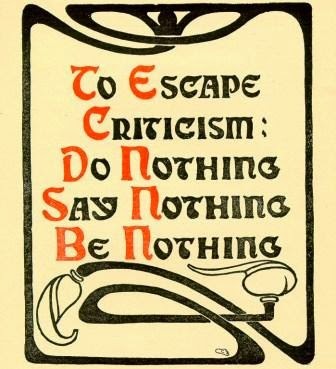 Handling criticism is an art, that needs to be acquired. And for that, acceptance is mandatory. Your writing is simply amazing..! The audacity with which you write makes everything even more interesting.. Totally agree. Its okay to cross the line in order to express something. But they need to be prepared for what has to follow. That's true Soumya. One must always learn from criticism and be able to accept their mistake and perhaps rectify it. There's too many people who may compliment you, only a few shall criticise. Great post and I enjoyed visiting your blog. Criticism drives me to go to the next level of whatever I'm attempting. Bring it. Me too. Hence I accept it whole heartedly. I voice out my opinion to people whom I care about. I have flaws too and have been bitten more times than one. I do not want them to go through that, since somewhere or the other what affects them affects me too. great topic and nicely written. 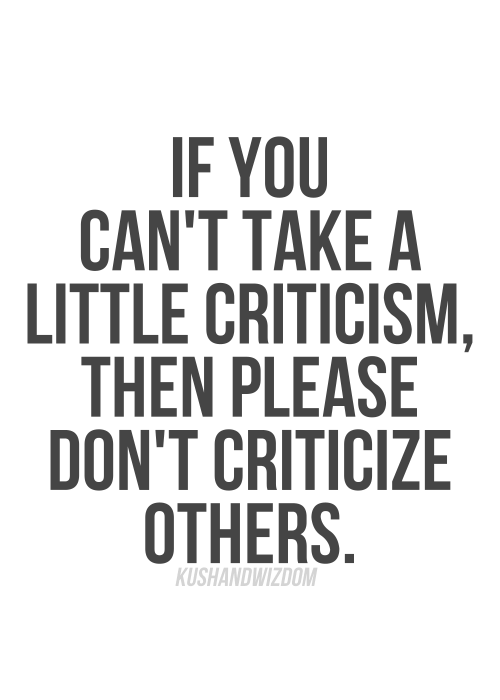 Well I criticize those I actually care about, or even people I believe can change after accepting my criticism. But there are some, who are so hallucinated and over the top free diving into an ocean of 'self appreciation and blatant boasting' that no amount of criticism can show them the need to be a better person or do better in whatever they are upto. I adore you because you do not shy away from being yourself. Fakebook.. hahaha..absolutely! I too have this itch to pull some people out of their narcissist mode but I keep mum. I have to keep mum because they don't matter to me anyway. Why shy away when you are more than happy being the way you are? Oh its a pain, ain't it? Don't use Facebook much any more. I find it rather boring. Most of us have trouble handling criticism. Most of us yes. But you need to start learning to accept it. I think everyone in the world should read this! Honestly I just learned a huge life lesson! Thank you for that! I'm glad it helped you! You are welcome. Well said! My husband always says "whatever you put on the internet,it is up for the world to see". So we should accept the fact that we need to take full responsibility of what we put up and how we put it. If someone can't handle it, they better don't do it in the first place- Be it a comment or a pic or anything for that matter. You have written this post very well and I love you and your blog for the bold honesty. Frankly I have a lot of things that I want to write but cannot since a lot of friends and family visit my blog. I know that certain things cannot be said aloud in my case and I accepted it. I need to handle them diplomatically. So I keep toying with the idea of starting another blog under a pseudo-name or a pen name so that I can let go more. I accept that I am this way and don't put up anything that will make a controversy. Acceptance is mandatory as you said, whether we post boldly or not. I totally agree with your husband! Its sad that you cannot express what you want to, because your family and friends visit your blog. But why not? If its the truth, let them read it too right. Its not like you are making up stuff about them! Think about it. Thank you for your kind words darling!